QR codes are everywhere – on posters, packaging, magazines and places you wouldn’t expect like bananas. But how do you read them and see what they’re hiding? 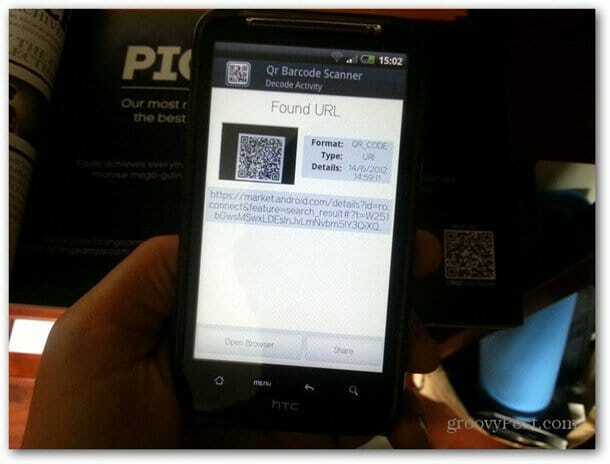 Here’s five free and high quality QR Code scanning apps for Android devices. I’ve used two different codes for testing – one that I’ve printed out on a sheet of paper, containing a lot of data – including a full business card. The second QR code only included the groovyPost URL, and scanned off my computer monitor. 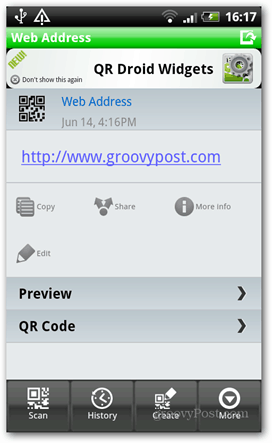 QR Barcode Scanner is one of the best software apps for reading QR Codes. It contains several features, and does more than I would have expected. 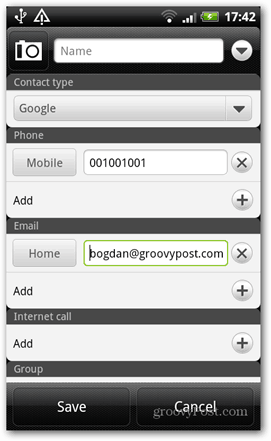 It has a simple interface that gives you access to each of the features it offers. You can scan barcodes, including ISBN numbers for books as well as QR Codes. It keeps a history of what you’ve scanned and it encodes data into QR codes, which you can then share anywhere you’d like. I’ve been using QR Droid for a while now. 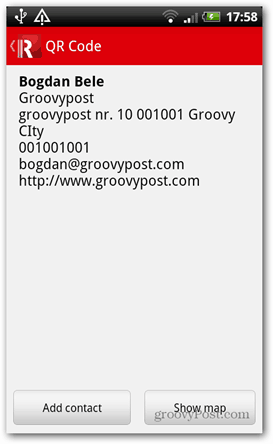 It’s a basic QR reader that does just what I need it to do. Definitely not as complex as QR Barcode Scanner but there are times when you don’t want something too complicated. It also allows decoding from URLs and manual key-in of a code, as well as decoding a code from a saved image. 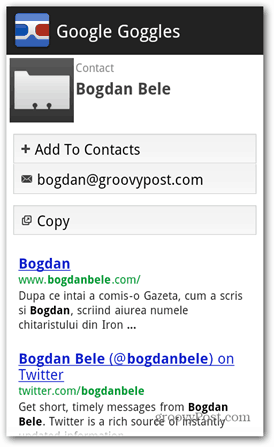 It lets you create your own QR Codes too. A code on my computer monitor took a little more time to scan than it did with QR Barcode Scanner, but things worked out fine in the end. The fact that QR Droid wouldn’t read the first code doesn’t make it a bad app, but it still means that there might be a point where you won’t be able to count on it. 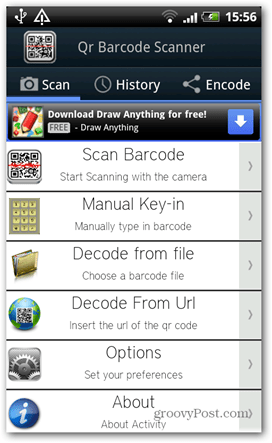 A more basic app, ScanLife, scans QR codes, as well as barcodes. It can also read barcodes that you input manually. 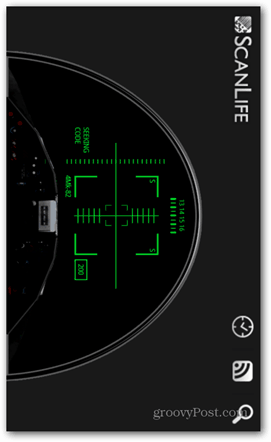 The interface is basic, but you can choose the look of your scanner target. When it came to the testing on paper or from my computer monitor, the scanning of the complex codes was fast. After scanning, I was taken straight to Android’s PIM app, with all the necessary fields already filled, which was a nice addition. RedLaser is more than just a QR code scanner. It’s more of a shopping assistant app. 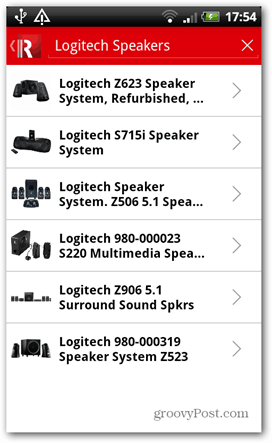 It lets you scan barcodes and QR codes then compare product prices, create lists, and more. It can even identify a product from a picture taken with your phone. It can also create QR codes, as well as keep a history of products you’ve been looking for and codes you’ve scanned. 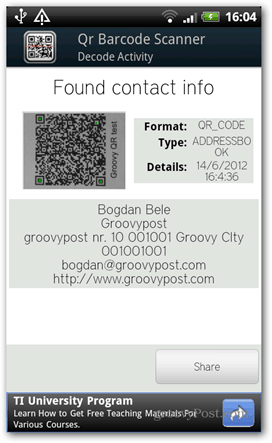 Its complexity can be a bit of a turnoff if you’re looking for a basic QR code reader. It scanned complex codes instantly and accurately, on paper and from my computer screen. You might think it’s odd that I’m including Google Goggles for this. Android users more than likely already have it installed. It lets you photograph objects and have Google recognize them for you. 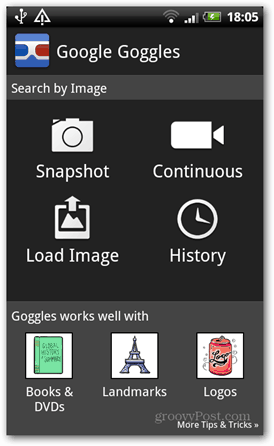 What you might not know is, Google Goggles features a QR and bar code reader. So, if you don’t want to try another app, you should know that Google Goggles is just fine for scanning QR codes. It doesn’t have complex options, but sometimes you don’t need them. 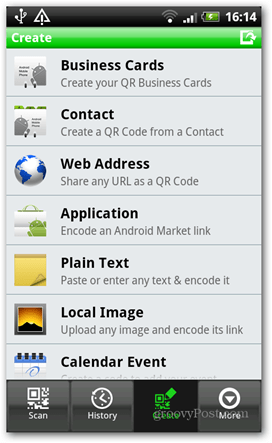 There are quite a few good QR code readers for Android out there. What’s even better is that these are free, and that you can choose your favorite based on the level of complexity you want. If you’ve used any of these QR Code Readers or have a suggestion for one not listed here, leave a comment and let us know.